A cream developer with rich vegetable coconut oil and castor oil for maximum protection of the hair and scalp. For 1 level of lightening. 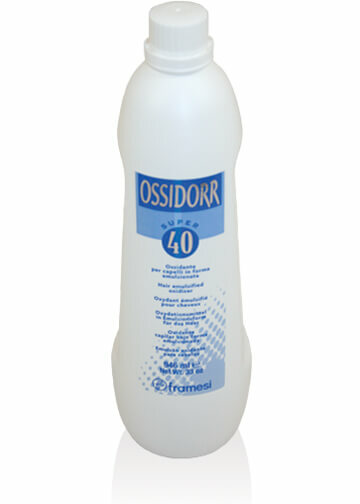 Ossidorr Developer is a cream developer rich in vegetable coconut oil and castor oil for maximum protection of the hair and scalp. Provides a smooth application with shine and condition. Leaves hair receptive to additional chemical services. Available at 5, 15, 20, 25, 30, and 40 volumes. Aqua (Water/Eau), Hydrogen Peroxide, Cetearyl Alcohol, Cetrimonium Chloride, Ceteareth-20, PEG 40 Castor Oil, Ethoxidiglycol, Methyl Paraben, Oxyquinoline Sulfate, Phosphoric Acid, Simethicone.